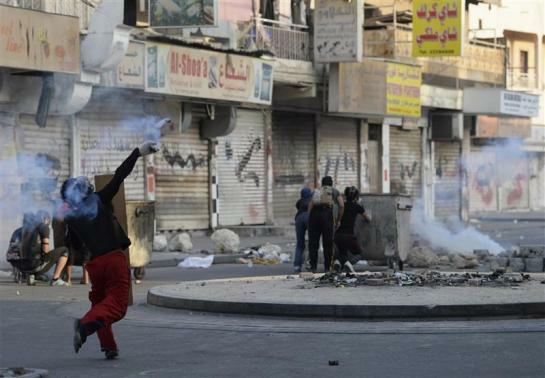 JNN 01 Mar 2014 Manama : Bahraini police fired teargas and stun grenades at hundreds of protesters throwing stones and petrol bombs in a Shi’ite Muslim village on Friday after the funeral , northern town of al-Daih , of a young man who died in custody, a Reuters witness said. The Gulf Arab nation, home to the U.S. Fifth Fleet, has suffered low-level civil unrest since mass protests in 2011 led by majority Shi’ites demanding reforms and a bigger share of power in the Wahabi-led island kingdom. Jaafar Mohammed Jaafar, 23, who was detained in December and accused of smuggling weapons, died of illness in custody on Wednesday, the Interior Ministry said, the second death of a person held on security-related charges this year. Rights campaigners and the main opposition al-Wefaq group said he had been denied medical treatment, and had been tortured, accusations the Regime always denies. Thousands of people attended Jaafar’s funeral in the village of Daih, west of the capital Manama. Dirazi is the latest victim of the Al Khalifa regime’s brutal crackdown on dissent. Protesters later threw rocks, metal rods and petrol bombs at riot police, who responded with tear gas and stun grenades. There were no immediate reports of casualties. Demonstrations and clashes with security forces erupt frequently in Bahrain, while negotiations between the government and opposition aimed at ending the unrest have stalled. Friday’s Mass Rallies have Jolted the Regime as the Doors to negotiations Due to the Non Cooperating attitude of the Regime may finally see the end of the Al Khalifa Regime , as The Syrian Conflict has already tilted the Balance of Power on its Side. The authorities say they have rolled out some reforms and are willing to discuss further demands, but the opposition says there can be no progress until the government is chosen by elected representatives, rather than by the king. More than 140 Bahrainis have been killed by security forces since February 2011, when the Bahraini uprising began in the tiny Persian Gulf kingdom. Thousands of pro-democracy protesters have since held numerous demonstrations in the streets of Bahrain, calling for the Al Khalifa royal family to relinquish power. This entry was posted in Middle East and tagged Al Khalifa, bahraini government, Jaffar Al Dirazi, Mohammed Jaafar, riot police, security forces, stun grenades. Bookmark the permalink.